Earlier I have written two post about making your own cyclic-voltammetry measurement system, in that concept a combination of PXI-system and homebuilt electronics were used. In this post I make a completely new cyclic-voltammetry system and with a different approach, that is by using a source measurement unit (SMU). The reason for this is that I fortunately have a few 100 volts PXI-4132, from National Instruments, source measurement unit (SMU) cards left over and the specifications of these cards are very good, 2 watt of power up to 100 volts and current measurement resolution in picoampere range. 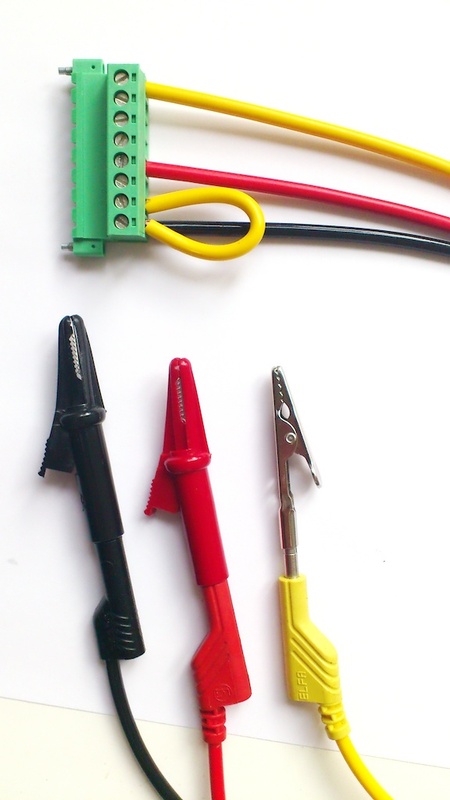 A source measurement unit is sort of an advanced power supply but with the difference that it can also sink power, that is drain a battery for example. On top of that the source measurement unit can operate as both a current source or a voltage source and if the card can do both this when sinking and sourcing power one say it has four-quadrant capabilities. Last due to the technic of a source measurement unit one automatically measure the current/voltage when sourcing voltage/current. Cyclic-voltammetry is used when one wants to analyse electrode-material, and/or some electro-chemical process. This is done by using three electrodes. Two of them are used for the electro-chemical process and the electric current goes through these two. If one monitors the potential over these two electrodes as one need to do in order to make a IV-graph, or if you repeat the IV-measurement in cycles a CV-graph, data will look strange, se figure 1:blue curve, what one wants is the red-curve in the same figure. The blue curve is from three consecutive voltage cycles so one also wants the blue lines to overlap better. Figur 1, two CV curves from the SMU unit, blue is two-probe configuration and red is three. The blue curve shows instability problems. All electrodes were copper-wires. This problem, they say, is due to the current that goes through the electrodes making potential unstable, however there is a solution to this and that is were the third electrode comes in. 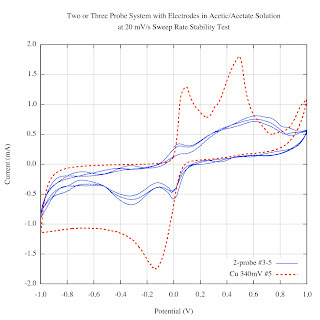 The third electrode is connected in such a way (high-ohmic thing) so that a minimum of electric current will pass through it and therefore measuring the potential against this electrode thereby reducing instability problem, that is the red curve of figure 1. The one of the two current handling electrodes you use for potential measurement against the reference electrode is called the working electrode, the other current handling electrode is called counter electrode. If you make experiments on the electrode itself, the working electrode, is the one you use and the counter electrode is then used only for suppling/collecting current from the electrolyte. The counter electrode must be made in such a way so that it dosent interfere with the process for example limiting the current flow due to too smal electrode surface area. The last thing to write about this is that the material of the reference electrode is free to be chosen. This because the reference electrode do not handle electric current and therefore is not directly involved in the electrochemical process. 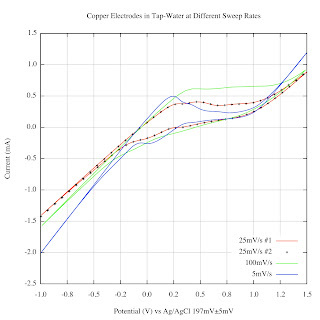 In the red curve of figure 1 a copper wire were used as reference electrode. One can instead use a more fancier electrode, like the Ag/AgCl type, specifically constructed for this task. Figur 2, An standard Ag/AgCl electrode. 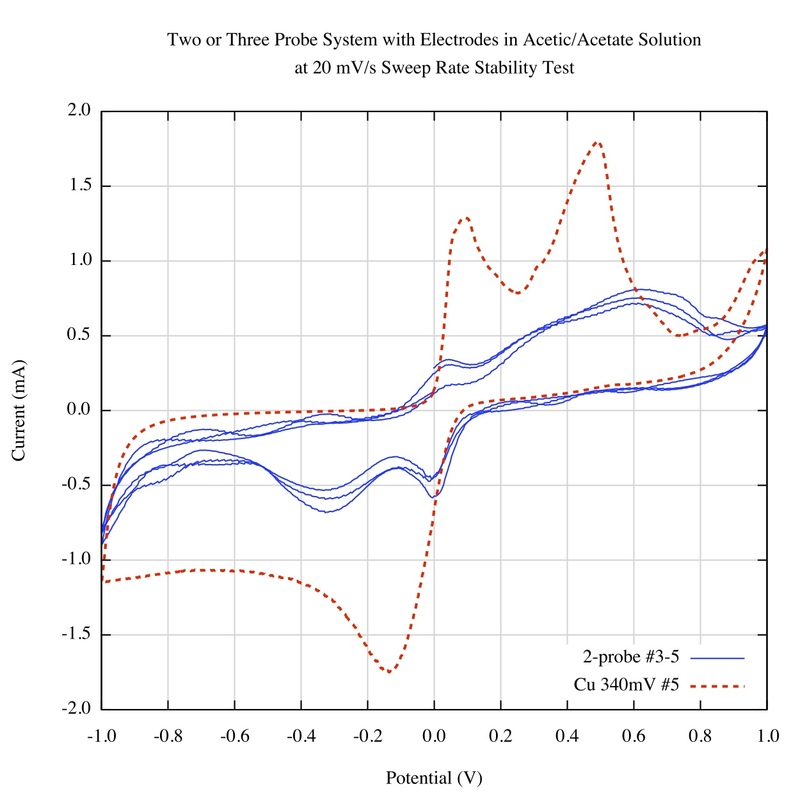 Because this Ag/AgCl electrode is a standard electrode, and its properties is well-known one can compare measurements from different experiments. Silver-Chloride is also light sensitive so one shall probably not keep this one out in daylight too long, I think. Sourcing voltage while measuring the current as done in cyclic voltammetery sound like a most suitable task for a source measurement unit. The problem is the reference electrode, i.e. how to connect it. Figure 3, the PXI-4132 SMU card and were to plug in the electrodes. The PXI-4132 source measurement unit card has sensing outputs, that means the card can do four-probe measurement and when doing so, the card do not measure the sourced voltage at the source itself but rather at the ends of a cables connected to the sense connectors. Figure 3 and 4 shows how to connect the cables to the card. The sense option on the card is made in such way so when used it dosent drain current from the point that you want to measure and that is exactly what we want for the reference electrode, just plug it in. 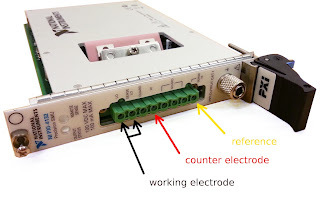 You measure voltage between the working electrode and the reference electrode so therefore you also need to connect the left over sensing output to the working electrode or as in the figure, a short yellow cable between the two outputs. Figure 4, the connector and cables used together with the card (left) and the copper wires used as electrodes (right). 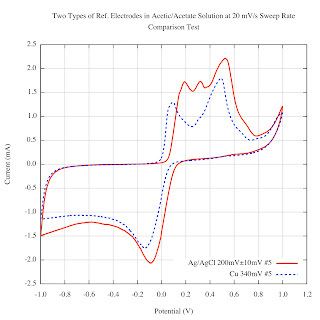 I have tested the concept preliminary by doing some cyclic voltammetry on a acetic/acetate solution with two copper wires as working and counter electrodes and a Ag/AgCl electrode as reference, figure 5 red curve. Figure 6 shows a similar run, but made on tap-water and here I wanted to check different sweep-rate speeds and repeatability. 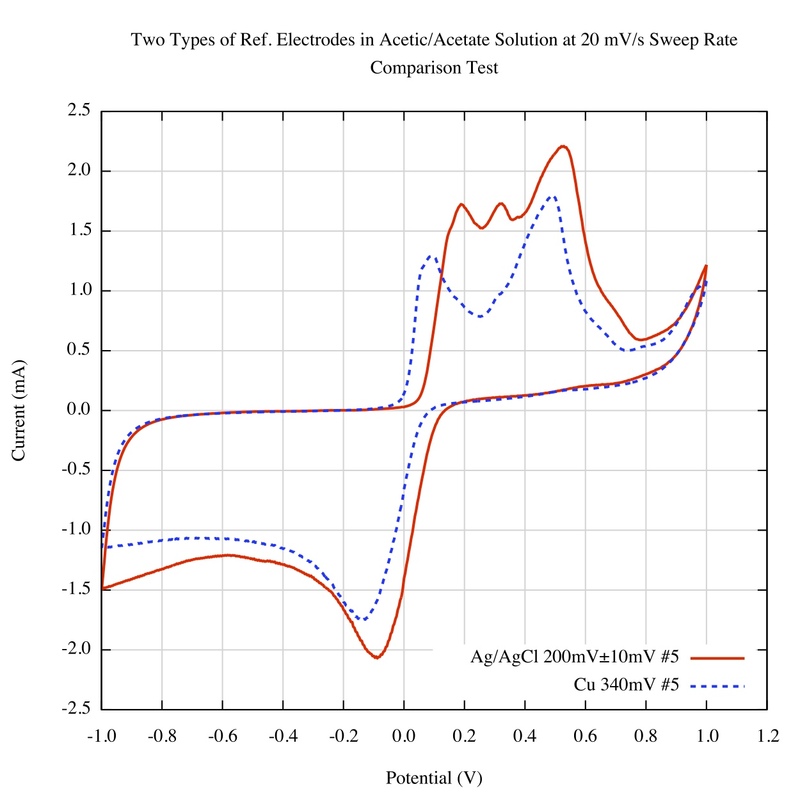 Figure 5, CV-graph of acetic/acetate solution at 20mV/s sweep rate. Two copper-wire electrodes used together with a Ag/AgCl reference electrode (red) and with copper reference electrode (blue). The middle peak in red curve that is missing in blue curve I do not know what it is. 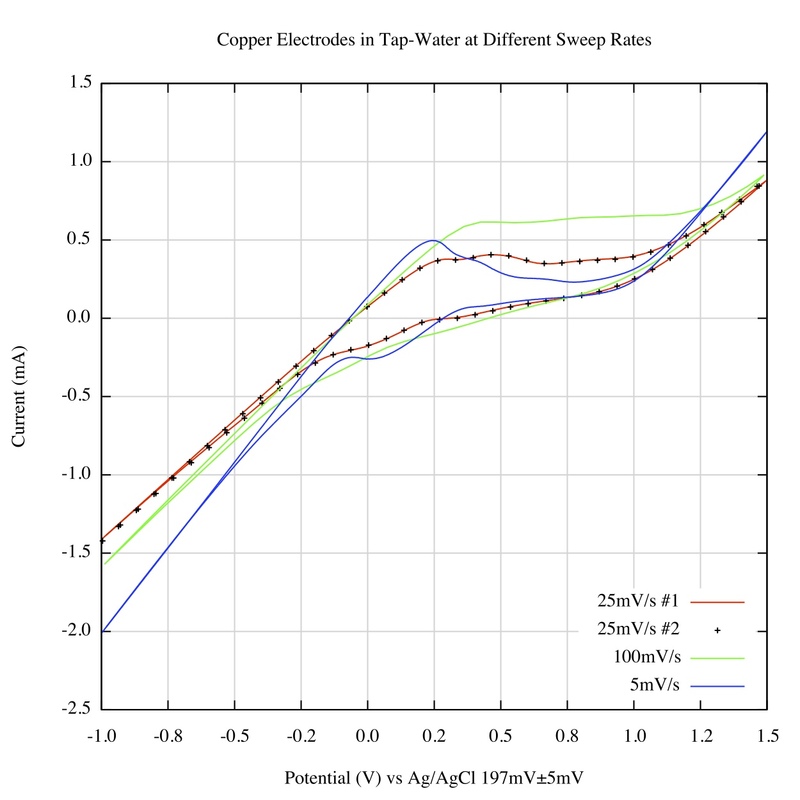 Figure 6, CV-graph of tap-water at different sweep rates, the dots and the red curve corresponds to two separate measurements but with same parameters and the good overlap indicates good performance and stability of the system. The results seems promising but I have yet to try a more advanced experiment to test its performance level. Tap-water or Sodium bicarbonate from the kitchen as used above is perhaps not so advanced, but it shows the princip that the system is operational. The drawback of the source measurement unit card is that it is not so fast, for cyclic voltammetry the speed is fine but if you want to do frequency analysis like Nyqvist plots the speed will not be enough so that is not an options for this system. A few thousands of samples per seconds is the limit of the card. On the other hand, the flexibility of the source measurement unit is of great use: want galvanostatic mode?, no problem, just configure the card as current sourcing instead as voltage source. Current or voltage limits can also just as easily be set. This particular source measurement unit card can handle up to 100 volts, and that is interesting, cause it allows me to do charge/discharge experiments on more voltage demanding task and the high resolution and picoampere capabilities allows monitoring of very low constant-charge current levels, that is 200 nA as lowest level. These two capabilities is good for example capacitor experiments. Integration of curve or other calculations can be included in the labView code. Table below shows how I made the output log file to look like, five simple columns in a txt file were the two last ones are integration values of curent and voltage. Here is the link to the LabView code I wrote for this, the ZIP-file is a snapshot from May this year so there might be some trash/experimental code inside it as well, beware. Using a SMU card (PXI-4132), seems to work very well for cyclic voltammetry measurements, flexibility is good and might be of great use. Speed is low so Nyquist measurements is not possible. I think I will report back on this topic when I done some more advanced experiment with this setup.